New Delhi [India], Oct. 6 : The Patiala House Court will today pronounce its order on whether to summon Union Textile Minister Smriti Irani on a complaint filed against her for allegedly giving false information regarding her academic qualifications. Irani had given information about her educational qualifications in affidavits to the Election Commission to contest various elections. In June last year, a case was filed by freelance writer Ahmed Khan, who accused Irani of providing contradictory affidavits about her educational qualifications during different elections. Khan's lawyer had informed the court that Irani, in her affidavit for 2004 Lok Sabha elections, stated her educational qualification as B.A. from Delhi University (school of correspondence). New Delhi, Nov 24 : Union Human Resource and Development (HRD) Minister Smriti Irani, who stoked a controversy following her meeting with an astrologer, lashed out at the media on Monday for bringing her personal life under the scanner. "I recognise that I bring TRPs. I recognise that and I appreciate the effort to continue to keep me in the headlines," Irani told the media here. Congress leader Rajeev Shukla , however, refused to comment on the issue. "I think 80 percent politicians approach astrologers and astrologers approach them. So, why do you single out one lady? Let her go," he said. New Delhi, Nov 11 : Union Human Resource Development Minister Smriti Irani on Tuesday expressed her anguish over the controversial comments made by Aligarh Muslim University (AMU) vice chancellor Lieutenant General (retired) Zameer Uddin Shah regarding girl students visiting the library. "It is unfortunate that when entire nation is celebrating the 125th birth anniversary of Maulana Abul Kalam Azad, such statements have surfaced. It's not only saddening as a woman but it also instils a feeling of resentment," Irani told the media here. New Delhi: HRD Minister Smriti Irani on Saturday asked the Jan Shikshan Sansthan (JSS) to empower the people through the Jan Dhan Yojana recently launched by Prime Minister Narendra Modi. "I would ask the JSS as to how you can empower the people through this scheme. If you have any suggestion, please let our officials know. Our officials will also announce new guidelines," she said inaugurating an exhibition on literacy and livelihood here. The exhibition was organised by National Literacy Mission Authority. 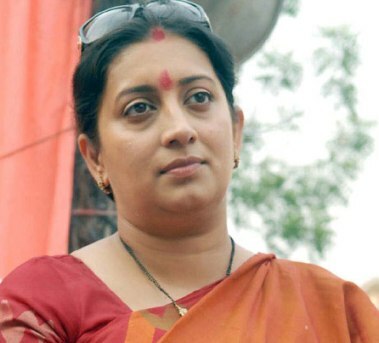 New Delhi, May 31: HRD Minister Smriti Irani Saturday appealed to the Delhi University vice chancellor Dinesh Singh to reinstate the five officials suspended for allegedly leaking documents related to her educational qualifications. Irani took to Twitter to express her opinion and said she has requested the vice chancellor to reinstate the officials. "Since the Delhi University is an autonomous institution, I have put forth my personal appeal to the VC to reinstate the officials," she tweeted. "In public life one should be open to scrutiny and criticism. So am I," Irani tweeted. New Delhi, May 26 : From promoting beauty products, to contesting the Miss India beauty pageant, to becoming the country’s most sought after ‘bahu’, and now set to be sworn in as a minister in the Narendra Modi cabinet - 38-year-old Smriti Irani’s life has been a saga of meteoric rise to fame and success. A star in her own right, Smriti’s political journey started in 2003 when she joined the BJP which has just pulled off a landslide win in the 16th parliamentary election by winning 282 out of the 543 contested seats. New Delhi, April 1 - Actor-turned-politician Smriti Irani will be the BJP's candidate against Rahul Gandhi and apex court lawyer Ajay Aggarwal against Sonia Gandhi, the party announced Monday. Irani will face the Congress vice president in Amethi constituency of Uttar Pradesh and Aggarwal will taken on Congress president in Rae Bareli in the Lok Sabha election. The decisions were taken by Bharatiya Janata Party's (BJP) central election committee in a meeting late Monday. The party also announced candidates for some seats in Tamil Nadu. Panaji, May 29 : Women will get "equal opportunity" to contest the 2014 Lok Sabha elections, BJP vice president and TV acterss Smriti Irani said Wednesday. "Women will get equal opportunity to fight in the Lok Sabha," Irani said, adding that she has been assured this by the party leadership. When asked if "equal opportunity" meant that 50 percent of the party tickets would be allotted to women, Irani said, "I cannot speak on behalf of the parliamentary board", which takes the final call on ticket allotment. Small screen’s biggie Smriti Irani is doing her comeback with the show maniben. com. After playing monumental inning with record breaking ‘Kyunki…’ she is leaving no stones unturned to recreate the same. She has adopted an exceptional way to promote the serial. Maniben was seen riding a scooter on the streets of Mumbai on Sunday. In the serial Maniben though is a diamond merchant’s wife but rides her side carted scooter as it is gifted by her father. Her act managed to gather decent attention. With many shows coming to an end last year and in the first quarter of this year, telly fans are missing the stars they had come to love through the years. We take a look at our favorite stars and whom we would like to see back to on television! Is anyone listening? First and most important we would like to see on TV again is none other than our own favorite bahu Smriti Irani known as Tulsi. She became a part of everyone's life for nearly eight years. Sasumas wanted a bahu like her and bahus wanted to know how she could look this good despite being at the helm of such a big family!